Alt DCM: Bud L. had no report at this time. Secretary: Jodi L. reported the minutes were emailed to DCM to forward to District after review. Motion was made to accept, 2nd, and passed. Motion was made to accept, 2nd, and passed. Meeting schedule: Alan R. reported corrections have been made to the meeting schedule and it is posted on the District website. Alan also provided several copies for members to take to groups. Storage Unit: Lynn T. reported that she has received the list of items from Delly S. Kim W. has the key to the storage. Dale B. brought items in his van, however both Kim W. and Jack A. were absent. 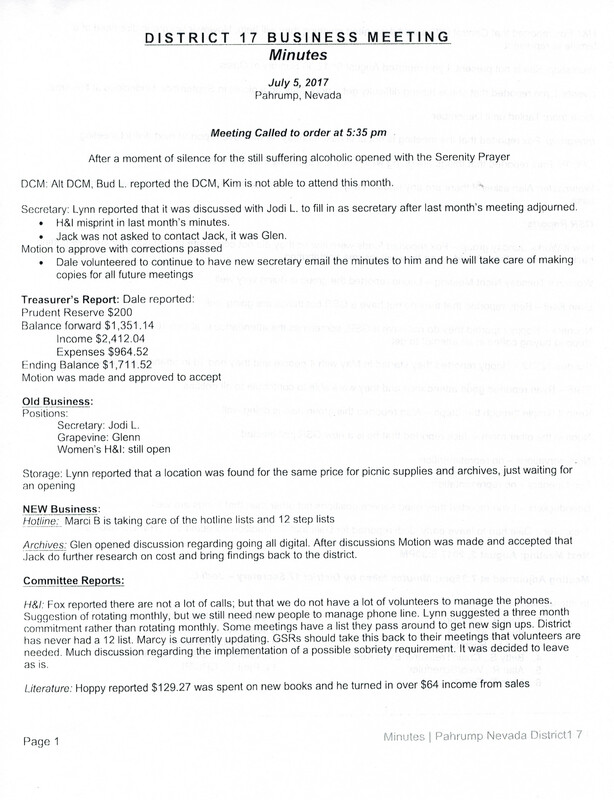 Item tabled to February meeting. Guidelines Ad hoc committee: December District meeting Kim W. was going to be typing those to present to the District. Kim W. was not present. Item tabled to February meeting. Website Calendar: Alan R. reported the website has been taken care of except that he needs all event information. If anyone could provide the event flyer originals, he will copy and paste to the website. He asks those be provided to him in MS Word format to make it easier for him to copy and paste. Hotline: E. Foxx reported that Laurie had the phone. She received 6 calls last month. Foxx is looking and has someone in mind to take the phone for next month. H&I: E. Foxx reported things are going well however he needs new people to get involved. He currently has some that are in the “approval screening” process. Delly S. reported that there are some women in corrections who have stated that they are not receiving the literature H&I has provided. Foxx has a meeting this month with the corrections leadership which he will discuss with them at that time. Grapevine: GeorgeAnn reported that she has sold all the grapevine books that she had and will be ordering more. Archivist: Jack A. was not present. Bud L. re-iterated that Jack cannot put in archives what he does not have. If anyone has items for the archives, please turn those over to Jack A. Events: Lynn T. reported that the next event will be tentatively March 11st for the Talent-No-Talent/Chili Cook-Off. Located at the Oasis from 12:30pm to 3pm. Al-ca-thons: John M. reported that the al-ca-thons were a success. Each meeting had between 8 and 10 in attendance for Christmas and about half of this for New Years. LV Intergroup Liaison: (Area 42 Intergroup is the 2nd Monday each month @6pm located at the Central Office in Las Vegas) E. Foxx reported the January 13th Fun Bus from Las Vegas to Laughlin has been cancelled due to not enough participation to be able to fund the event. CPC/PI: (Area 42 CPC/PI is the 2nd Monday each month @4:30pm located at the Central Office in Las Vegas.) Paul U. reported that things were going well. Alan R. stated that he was at the library and that other organizations were using our literature racks. GeorgeAnn also stated that she was at Westcare and their literature rack was very low. Paul U. will take care of both issues. Webmaster: (Libby – Area 42 Webmaster) Alan R. reported as previously stated that the website is all current and updated. Nooners: Hoppy H. reported that attendance is usually between 12 and 17. They are above their prudent reserve and they have donated to District 17 for two months in a row now. Sunday 12×12 study: Hoppy H. reported this meeting is mostly court cards. Luckily they are not being charged a specific rent amount. TGIF: Christine R. reported the meeting is doing well. The group will be sending her to Area. Noon in other Room/Men’s Stagg: Jack A. was not present. John M., Alternate G.S.R. reported they have great attendance. They are starting their own Ad hoc committee to create guidelines for the group. They are also involved in Bridging The Gap by having a P.O. Box for inmates to correspond with members. Even Keel: Glen J. was not present. Betty S., Alternate G.S.R. reported they are doing good with a steady attendance. Women’s Meeting: Laurie M. was not present. Dawn, Group Treasurer reported everything going great. Last week they had 16 in attendance. Sharing How it Works: E. Foxx reported the meeting has consistently 20 in attendance. Last month speaker meeting had 40 in attendance. The group has no Ad hoc committee and is not interesting in having one at this time. No Reservations: Harvey was not present. Ryan W. reported that Harvey has been having some physical ailments so they are currently seeking a G.S.R. but to keep Harvey on the list until there is a replacement. Keeping it Simple Through the Steps: Alan R. reported they have 3-4 in attendance and half of those are new people. Boondocks: Delly S. was not present. Lynn T. reported they are doing well and had 21 in attendance last week. 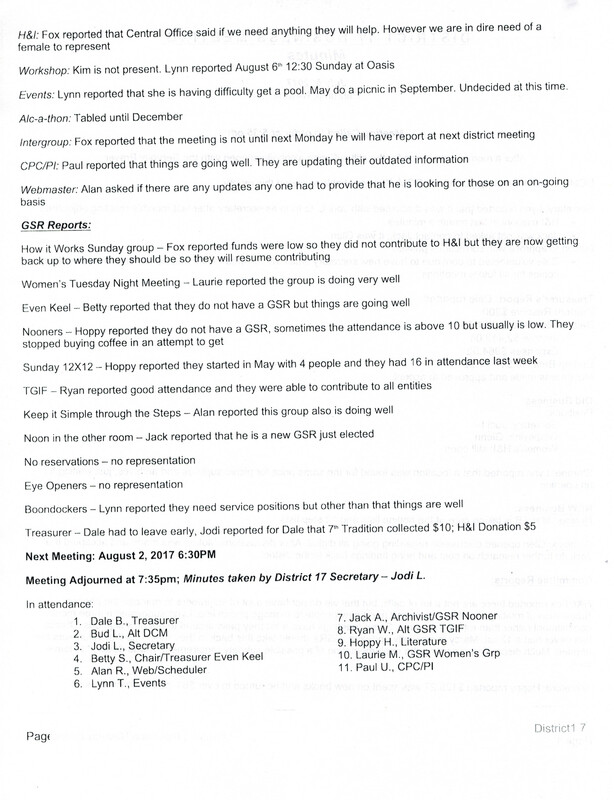 Meeting Adjourned at 7:32pm; Minutes taken by District 17 Secretary – Jodi L.